I drafted a far-too-lengthy blog post as I worked toward my publishing deadline: partly to get things straight in my own head. (This is the first part of it, polished and condensed.) I had been aware of most of the issues I cover in this piece, and had been attending to many of these tasks (listed below) as background work in between writing and editing. Some of the chores, though, I left till the end. There's lots of good information about this same topic here, too, at Jane Friedman's "Self-publish your book" site. So, you've written your book, you've got your cover design, you've decided how and where you're going to publish it: what are the “final” steps required to make your book available to the public? Okay, let's go through each of those sub-topics, one by one. Template for your MS. This is listed first because in an ideal world, this would be your step zero, before you even start. I wish I'd known this before I started. It was a real pain (took me a couple of days) to convert my MS into the preferred template for the publishing platform I'd originally chosen (for me this was the CreateSpace template, since the print edition is the one whose layout and typography can be locked down, and with the tightest restrictions). Partly this problem was caused by LibreOffice (which reminds me, I still need to report some problems to that most excellent crew of dedicated and generous people). If I had started the MS using a template suitable for a print edition, most of those problems would have been avoided. 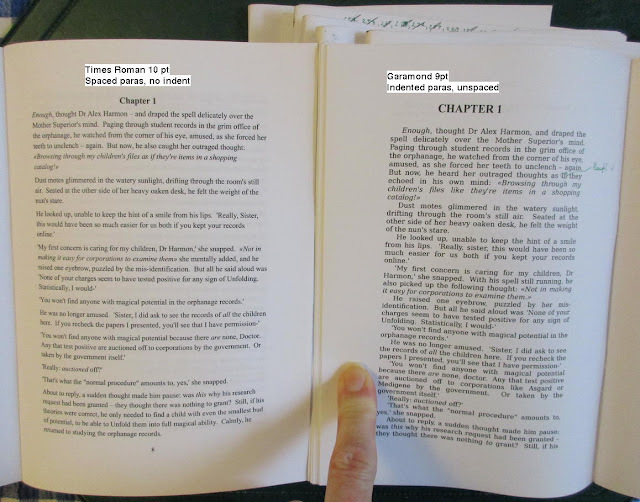 Physical size of the page for the printed edition. I would have liked to have chosen the traditional small paperback size, but with CreateSpace that wasn't an option, so I had to go for the smallest available, which in my case was 5"x8". Can print on inside of cover? Handling of US tax exemption? From what I've seen, they're pretty comparable in most of the other aspects you need. Here's a short article from someone who's used both: Print On Demand: CreateSpace or Lightning Source? For me, the killer argument is the local printing. Amazon charges about A$30 to ship a printed book from the US to Australia: they have printing facilities in the US (and maybe the UK – I'm not sure). But although they have POD, they don't bother with offshore POD, which seems mad to me. It's certainly extremely unhelpful for self-published authors outside the US. That point alone was enough to make me change my plan: it makes my printed book affordable, rather than absurdly expensive, in most countries. Finalised MS – including dedication, acknowledgements, and in the format(s) suitable for publisher. You'll also need this to know how many pages, so you'll know the spine width for the cover design. Tagline comes before the cover, since it's usually a good idea to have this appear on the cover! Blurb also comes before the cover design, since if you're going to produce a print edition, you'll need a blurb for the back cover. You obviously need to make this as compelling as possible. It's one of the massive hurdles for your book to be chosen by a reader: you need to make it an appealing invitation rather than an obstacle. Expect to spend a lot of time, and a lot of revisions, getting it right. The time is well spent, though. Bio – again, needed before the cover is finalised. Make it engaging and suited to the genre. You'll also need several, of different lengths for different purposes. Cover – including license to use any images involved, and related notes (copyright or credits) to include in the MS. If you're a book cover designer, great. If not, buy a design somehow – I've blogged about that, earlier. (Book Cover Design). ISBN(s) If you're going to produce multiple editions, it makes a lot of sense to buy more than one. You can often rely on the publishing platform to supply you with one if you want, but there are good reasons for acquiring a bunch of these: ten ISBNs will typically cost about the same as two individual ones. A block of sequential ISBNs is used by some industry bodies to identify a publisher. Check to see, in your country, who has the rights to sell ISBNs: it's generally not permissible, I gather, to re-sell an ISBN. For self-publishers, buying a bunch makes sense since the “publisher” (you, if you're self-publishing, obviously) is encoded in the number, and helps various organisations (like libraries) identify you as a publisher. To my way of thinking, that should be one small piece of the puzzle of branding yourself and promoting your work to help people discover you. In Australia, the agency involved is Thorpe-Bowker Identifier Services. I found Joel Friedlander's page helpful: ISBN for self-publishers since it answered a key question I had: do I need a new ISBN if I re-issue a novel if I fix errors found after publication? (Ouch!) The answer is “No” since that's considered just a reprint. (I suspect you should go and visit your ISBN management page and increment the Edition number in the ISBN register, however). Apparently the question of whether you need a separate ISBN for printed and eBook editions is still undecided (though IMHO, they're obviously different and deserve different ISBNs). And for myself, since I'm seriously considering the idea of producing (1) a US and (2) a UK spelling edition separately, and (3, 4?) one or two more print editions, and possibly even an ebook edition that's helpful for the reading-impaired, I may well end up consuming 5 ISBNs per book I write! You may be offered the option to buy barcodes. Doing so may be an easy option; or the publishing platform is quite likely to do it for you, since the visible barcode is produced simply using an algorithm that is fed your ISBN. There are also free tools like Zint (http://sourceforge.net/projects/zint/) for producing the barcode. Where should the CiP entry appear? The CiP entry should be printed in the book on the reverse side of the title page. The entry must appear under the heading: National Library of Australia Cataloguing-in-Publication entry. The CiP may be ranged left or centered to suit publishers' individual design arrangements. For electronic publications, the CiP entry should appear near the title and other publication details. The (Australian) Copyright Act 1968 requires you to deposit a copy with the National Library. Pricing I don't have much to say, here. Much more financially-savvy peole than me would no doubt prepare spreadsheets and make various projections and what-not. I basically just sat and thought about it for a little while. Any printer/publisher must charge you a production fee for each book printed, obviously. For IngramSpark, the prices to me seem reasonable, and you can (and should IMHO) choose to print on demand (POD). The amount you charge above the production cost is how much profit you make; but you should offer a discount if you hope for any book stores to put your title on their shelves – they need to make their profit! I think the normal figure is something like 50%, but don't quote me on that. A trap to avoid is “Returns”. I gather that no large chain book store will stock any book unless the publisher allows them to return unsold copies. The delivery cost for shipping the books back is paid by the publisher: that means you! So if the book store guesses wrongly, and orders too many, and returns them: yes, you can easily end up losing money. Smaller book stores may be content to order a few, with no returns, and will just sell off unsold copies at a steep discount (and order no more), rather than returning unsold books. I have no idea why the larger chains seem not to grasp the idea of POD and adopt the same approach, but since the norm is to use the “returns” system, and that costs them nothing, then why should they complicate their business just to support the smaller presses and self-publishers? Anyway, I decided not to allow returns. At least that way, I know I won't be plunging into debt if someone orders too many copies of my book. Book metadata This includes the genre(s) your book falls into, tags or search terms that help categorise the book, ISBN, CIP or LCCN, series number, edition, publisher, author, blurb, etc. Put some thought into getting this right. If I recall correctly, when I assigned ISBNs to the print and ebook versions, using the “Manage my ISBNs” part of the Thorpe-Bowker website, part of that included specifying categories and sub-categories that applied to them, from long drop-down lists. Likewise, Amazon allows you up to seven category/search-terms to apply to your book to help readers find books they like. Membership of the Copyright Agency You should locate your national body for managing and recording copyright, and register with them. In Australia it's the COPYRIGHT AGENCY. I gather that if libraries buy books, they make some payments to the Copyright Agency and they in turn disburse portions of the total pool to the authors of the books. I don't know much about this. Basically, I think they look after payments due to you that don't come from your publishing platform (e.g. if you're using KDP, Amazon should pay you directly). Email list (Contact list): chances are, there are a bunch of people or groups you're in contact with via email, who may be interested to know you have a book. Think of the various circles of people you know: friends, family, acquaintances, colleagues, schoolfriends, facebook, twitter, goodreads, … IMHO each of these circles deserves a separately-written announcement, simply because each circle has a different aspect to it. I think it would be silly to do a “one size fits all” announcement: it's going to look like spam since it won't be written with the clear interests of the recipients in mind. For myself, over the course of 2015 I told many people I know that I'd written a book and planned to self-publish it that year; and most of them said they'd like to know when it becomes available. So: a single email to those people, being careful to either email it one by one, or else Bcc to everyone (you don't want to be handing out all your acquaintances' email addresses to each other, naturally) seems like it will be appreciated. Don't send it more than once, if you want to avoid looking like a spammer to your friends! And many ISPs (and gmail!) consider sending an email to a large number of recipients as suspicious, and possibly spam – and will react accordingly. So be careful. Local book stores, libraries, or schools: if you frequent some local book-stores, newsagents, etc. they may be interested to know you've published a book. It can't hurt to have a chat, and pass on the information they'd need should they wish to put a few copies on the shelves. If you do have some posters, take them along with you, and have a few copies of your printed book. I don't know if they'd be so interested if you have ebooks only – I don't think physical book stores deal much in those (why should they?). A local school might be interested in having you along to speak to a class: you can tell them about the lavish lifestyle you can lead on A$12,500 per annum. :-) On the other hand, your books could potentially keep earning for you year in and year out, and even 70 years after you're dead, so it's a bit hard to compare writing to other careers. Video chats – I've talked a little about this topic previously, “Emily Craven's brilliant idea for indie-published authors” and her idea about attending book club chats by video. Reviews – I've talked about some risks involved in this very-important topic previously, “Amazon and reviews”. If you google for people who do book reviews in your genre, you should find numerous opportunities: but be aware that genuine reviewers will generally be flooded, and need months before they'll find time to get to yours. So contact them as soon as you have finished polishing your MS, and preferably contact them earlier to see if it might be possible to reserve a “slot” in advance. Business cards, flyers, posters. It's not too hard to design a business card, and there are good online companies who will take a PDF and print you off a bunch of good quality cards at good prices. Put yourself in the shoes (mentally) of someone who wants to sell your book, and consider stuff you might use to help them to promote it. Interviews could be with a local community radio station if you're lucky, or a text-based interview, or you could take questions and then post a video with the questions displayed while you answer them to the camera. There are many possibilities. Book trailers - Advice on the value of this varies. Discount promotions: as a marketing tool, people do like getting stuff with discounts, or even free. E.g. Amazon's Kindle Select programme allows you to nominate 5 days per month when your book is discounted. The idea is, of course, that you then let people know in advance that the discount days are coming up. You can choose either “free days” where people can literally get your book for free, or discounts (where it might cost just $0.99). I suppose I'll be finding out more about that in due course. For myself, I think people tend to assume that if they paid nothing for something, that may be what it's worth, so I'm not that keen on the free-days idea, myself. Facebook: I found these pages very helpful, for my use of Blogger and making it easy for that to work well with Facebook users or followers: Adding meta description tags, and also here, here, and here. Honestly, though, those are probably going well above what you need to do, and you probably need some knowledge of HTML and maybe even a little coding. They're very optional things to do; only if you're comfortable with that kind of thing. You can (and probably should) also set up an author page on Facebook, though. I myself plan to do that – but I haven't gotten around to it, yet. Anyway, my own plan is to do almost nothing. When everything's all ready I'll tweet about it, probably a countdown of ten tweets spaced out through the day – with an occasional follow-up/reminder tweet (maybe once a month? ), afterwards. I'll also blog a little and tweet about what I've done and what I'm working on next. But mainly, I'll be relying on readers telling people about it, provided they liked it. Ideally, some of them would also write a review! I figure that if people start doing this in general, any book will earn exactly the success it deserves, and readers will find good books by word of mouth on social media (or, heaven forbid, face to face). And to carry on writing the next book(s). I should add, that when I prepared the first print edition, at the end of the process IngramSpark presented the option of a one-off charge of US$60 to promote the book. I think this is how book sellers are informed that your book exists, so it seems very worthwhile to do that. Okay, that's the end of this "review" of the "Marketing Plan" topic. But make sure that what you do has a strong element of reciprocity: if people are helpful to you, make sure you are at least as helpful to others, in return. “Elevator pitch” Have this polished and memorised: people will ask you “So, what’s your book about?” It's well worth the effort to come up with a short, punchy description. Trust me, you don't want to sound like you yourself can't easily describe it, or you're not sure what your book is really about, at its heart! Synopsis: I think this falls more into the category of stuff you need if you want to get traditionally published, along with cover letters, query letters, and outlines. It's probably a good idea to write a synopsis just for yourself, especially if your plot is complex, or you have a series planned and you want to keep things straight. It can also be helpful to getting you to distil down something for the press release. Create Your Author Page(s) This should at least be on your publishing platform – e.g. for Kindle Direct Publishing, they have an Author page (it's called Author Central: it's the 1st link you find if you enter this URL: https://kdp.amazon.com/help?query=author+central, and then Join, and set up your info. For my part, when presented with the Terms and Conditions page, I copied that and pasted it into a document and saved it away for possible future reference. Note that you can't complete this step without a published title; and if you have only saved your published title as Draft, then it won't be visible and you won't be able to continue.). For the platform that makes your book available, there's probably going to be somewhere for you to record information for tax purposes. Be aware that Amazon make it easy to do this, which will reduce the tax you pay in the US (provided your country has a reciprocal taxation arrangement in place). Goodreads has a similar thing. You may need to have finalised the Publish step, or you may be able to create the Author page(s) just before publication, so that it's already when you finally “Push the self-publish” button. On Kindle, Amazon provides the ability to create an Author page, and by default it gets a peculiar ID code built into the URL. But they also provide an easy way to set up an “Author page URL” so that potential readers see a meaningful (memorable) URL, not the weird code. (E.g. my Amazon author page is http://amazon.com/author/ljkendall, which is a much nicer URL than the raw one: http://www.amazon.com/-/e/B019DUHM9E). Amazon also provides various resources at their Author Central area: https://authorcentral.amazon.com/, and as an author, you also hav a kind of web-based dashboard for managing your Kindle ebooks: your titles will appear under a URL like this https://kdp.amazon.com/ with several useful tabs like https://kdp.amazon.com/bookshelf, when you create your Author page for Kindle. I expect those links I've provided won't be an indication of what they look like when you become an Amazon author – I've just provided them for reference for you. This post is already too long, so I'll cover more about the nitty-gritty side of the conversion to ebook format and upload to Amazon in a later post. You should provide the tax info that Amazon (or equivalent) asks for – you'll need your taxation ID, then you fill out the forms which are quite self-explanatory and well-designed. In my case, this meant that the tax withholding rate dropped from 30% to 5%. You should also provide your bank account details, so the money can be paid to you directly, rather than via cheques. The only tricky part of this was providing the “BIC code” required to identify the bank, but a Google search on “BIC code” and my bank name lead me directly to the right page for my bank, and from there I was able to paste in the (in my case) 11-character ID for my bank. Likewise, after your book has been published you can create an Author page for yourself on Goodreads. Mine is https://www.goodreads.com/author/show/14771366.L_J_Kendall. That page provides good opportunities to engage with your readers, so it's also worthwhile spending time setting up your “home” there on Goodreads. You can get fancy with your author pages, and prepare “Trailer” videos for your book, and provide videos of “interviews with the author”. If you do, you'll probably need some coaching and advice at the least, and professional editing and video creation help as well. Publish! Okay, there are two main sub-topics here: creating and providing your ebook edition and your print edition. Now, because this post is already way too long, and there's a lot to cover in each of these topics, I'll write each up separately. But hopefully the information above will help you prepare for the final(?) steps in your self-publishing adventure! Adventure #1 in publishing: Creating the ebook! Even briefer status report - published!